This is a delightful warming sweet thick soup to enjoy on a chilly day. 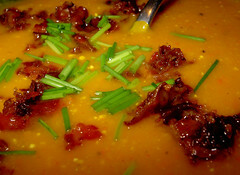 The dates give it a nice subtle sweetness and the pomegranite garnish enhance the soup. Saute the chopped onions in the olove oil until they are translucent, add the thyme and tarragon, the pumpkin and the red lentils. Add the stock, chilli flakes and water and simmer gently until all the vegetables are cooked. Add the tomatoes and the dates and puree the mixture until smooth. Add a splash of lemon juice and season to taste with a pinch of salt and cayenne. Garnish with coriander leaves, chilli oil and pomegranite seeds.